What I do know, however, because I read about it in the newspapers, is that 59 years ago today, scores of Portlanders, including pilots, police officers, and just plain civilians like you and me, saw – or at least thought they saw – flying saucers above the Rose City. 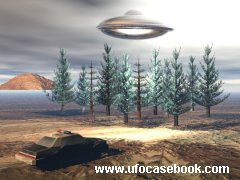 According to no less a source than The Oregonian, the first flying saucers, or whatever they were, were sighted directly over Oaks Amusement Park. Immediately, the police bureau put out an “all cars” alert, which was answered by three patrolmen who said they saw them, too. One of them, Earl Patterson, identified as an “air corps veteran,” said they were traveling fast, “wobbling and weaving,” and in his opinion they were not airplanes. Capt. K.A. Prehn, along with two of his men at Harbor Patrol headquarters on Irving, reported seeing several “discs” pass overhead at a height of 10,000 feet. But lest you be tempted to take the easy way out – which is, of course, that these mysterious objects were actually top-secret CIA weather balloons – there’s the report from a United Airlines plane en route from Boise to Portland that night. The discs, which were flying at about the same altitude as the plane, followed them for 15 minutes before suddenly vanishing. “No object I know of could disappear so quickly,” observed Smith. They just don’t write headlines like that over there anymore. But then, to be fair, we haven’t had a decent UFO flyby in a long time, either. Contact Phil Stanford by phone at 503-546-5166 or by e-mail at philstanford@portlandtribune.com.